There’s no denying the importance of social media in sports marketing. In fact, the best sports teams on Instagram draw a pretty hefty cheering section. When you think of top Instagram brands, the team sports category doesn’t likely pop into your head. But it kind of should. You see, major league fans from all types of organized athletic clubs are an extremely enthusiastic bunch when it comes following their heroes. In fact, they are the most engaged, loyal, and obsessed (in a good way), displaying the most unrelenting type of fanaticism. These devotees worship their teams in an almost cult-like manner, seeking to support them far beyond buying merch and game tickets. They minutely follow what their favorites are up to, and dedicate a lot of time keeping up with players, stats, rankings, and sport hashtags on social. Spoiler alert: that bodes well for these teams on Insta. Major league organizations are able to use social platforms for sports marketing campaigns. This helps to feed the mania and create stronger bonds with their supporters. It’s no coincidence that these Instagram accounts garner some pretty intense enthusiasm from their followers. We’ve only once broached the sports team subject, where we uncovered a telling piece of evidence leading to only one conclusion: this niche yields a ton of engagement on the platform. Safe to say it can be attributed to team fervor and the religion-like devotion that professional team sports bring out in people. These big clubs will always have armies of fans pledging their unwavering allegiance, but we thought it would be interesting to investigate things a little further. 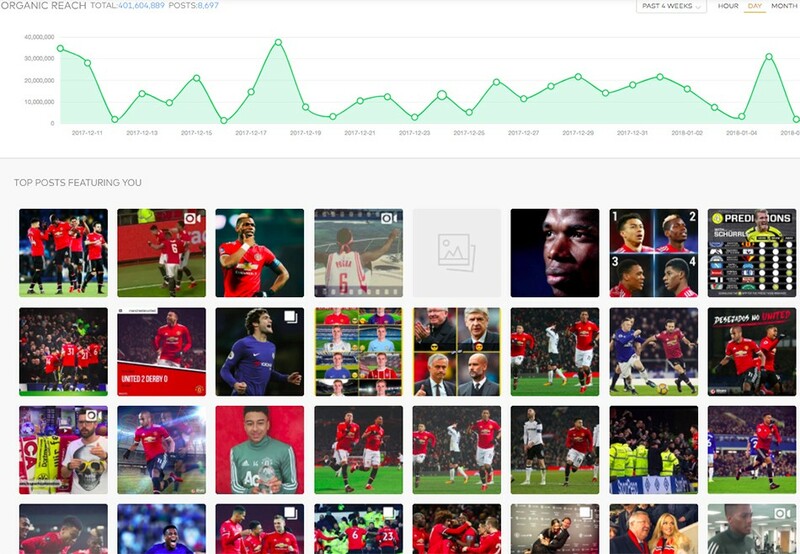 What strategies are the most followed sports teams on Instagram using? Are they all publishing the same type of content? What kind of posts are fans most likely to engage with? We scrutinized the content of five major league teams belonging to five different sports to understand what supporters are into, regardless of affiliation. No sport is more popular than football in the United States of America. It has legions of die-hard fans who support their teams with as much zeal and enthusiasm as kids on Christmas morning. 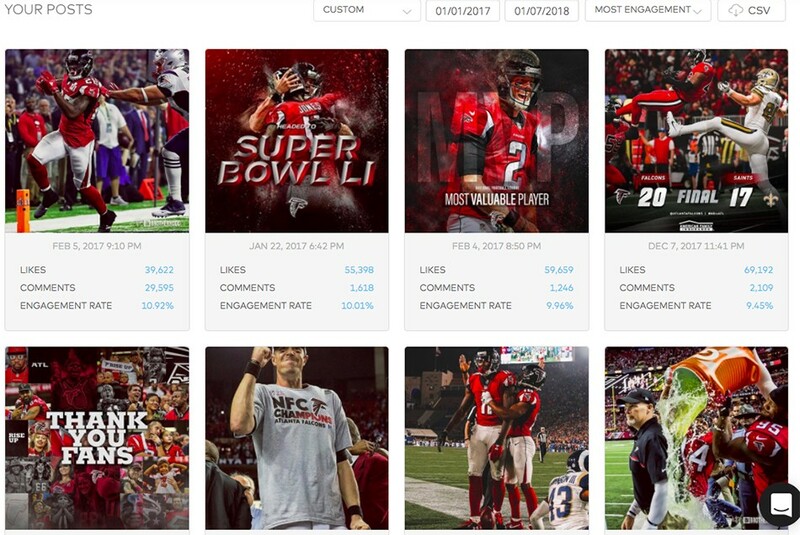 We checked out how last year’s Suberbowl runner-ups, the Atlanta Falcons, are conducting business on the ‘Gram. Things are going quite well, as it turns out: the team has amassed 770k followers on the social platform, a rowdy crowd that generates a stratospheric 3.16% engagement rate for the club. This might explain how the Atlanta Falcons got closer to their fans in recent seasons? Let’s dig in a little deeper into the account’s activity. 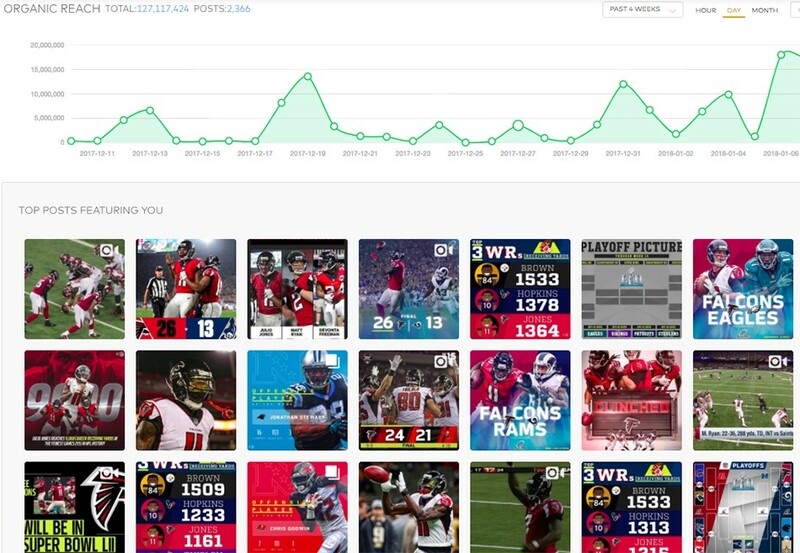 The Falcons’ most engaged around posts in the past year are a collection of team spirit and winning themes: the first being an image of a player crossing the end zone, followed closely by a Super Bowl announcement and the news of the team’s quarterback being named MVP. Meanwhile, the account’s most viewed videos are adrenaline-filled moments on the field, accompanied by an emotional farewell video of the Georgia Dome’s demolition, the team’s former home. We know that video posts don’t necessarily yield many engagement actions beyond views, and these videos all performed well above average. 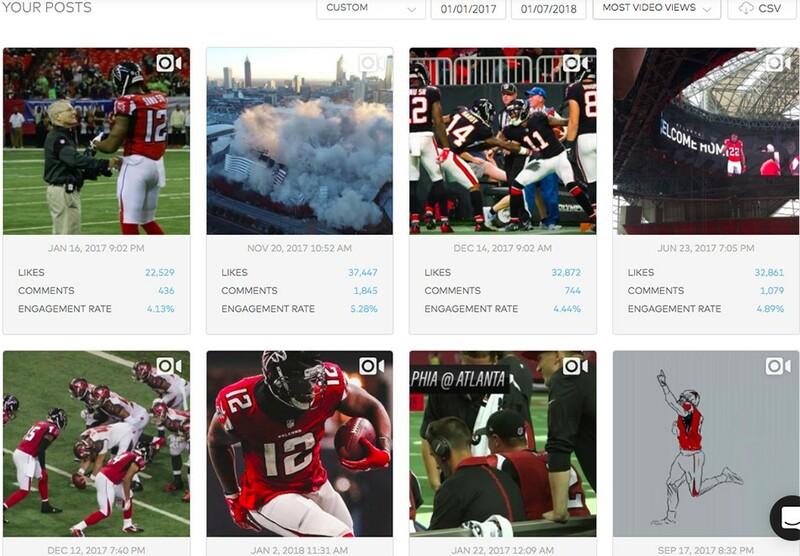 In the last 4 weeks alone, the Atlanta Falcons Instagram account earned 2,366 pieces of user-generated content, which yielded a reach of 127,117,424. NBD. The Manchester United has some pretty avid fans. In fact, Soccer, aka European football, is one of the most popular sports in the world. People can get so overzealous that some supporters are prohibited to travel for their favorite team’s away games, a ban resulting from one too many aggravated brawls in the bleachers. 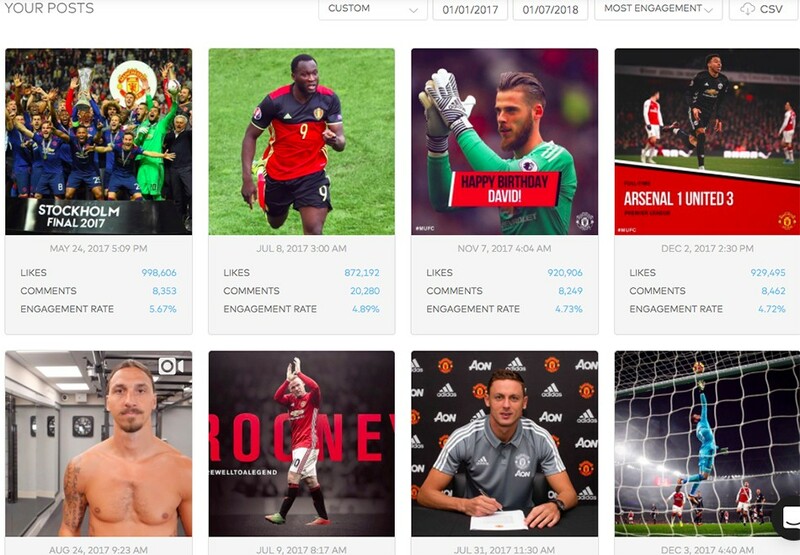 The Manchester United marketing strategy might be one of the best in the biz, as the club’s Instagram account boasts a whopping 20.2m followers, the largest of all the accounts observed here today. Even with this huge audience, the soccer club still manages to keep a high engagement rate of 1.57%, an unusual number for an non-individual account of that size. Below, we examine what content resonates the most. 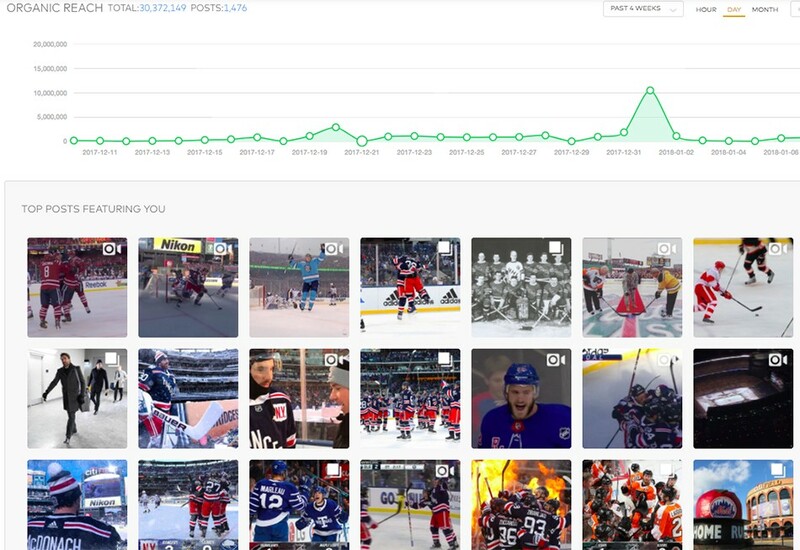 When we look at the team’s most engaged-around Instagram posts of the last year, they consist mostly of featured individual players, with the exception of the number one spot, which goes to a shot of the whole team post-championship win. An equally interesting observation is that there is a video post within the account’s top 8 — another unusual circumstance with top performing video. When looking at the Manchester United’s most viewed videos in the past year, the great majority of them are highlights of exceptional plays leading to goals. It’s clear that fans want to bask in their team’s successes. 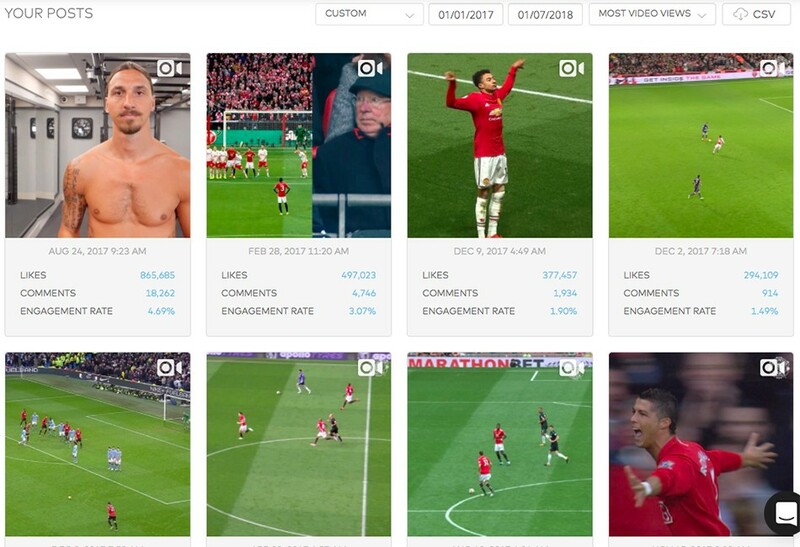 In the last 4 weeks, the Manchester United Instagram account earned 8,637 pieces of user-generated content, which yielded a reach of 401,511,449. Nothing less for an account of 20 million+ followers. Hockey might not be the biggest category in the sports niche, but it doesn’t make it any less great. We decided to put the New York Rangers under the microscope, a very famous and successful team that consistently keeps its ranking on the up and up. In fact, its Instagram account currently displays an enormous following of 810K, along with a super high engagement rate of 2.33% to boot. Let’s see what the Rangers’ top content is. The Rangers’ most engaged-around pieces of content in the past year prove that New Yorkers will be New Yorkers, and dispense the double taps for celebrities. The top 8 posts are mostly special moments beyond the actual game, meaning that this hockey club really focuses on telling the full story of the team, something that its audience is obviously really keen on. 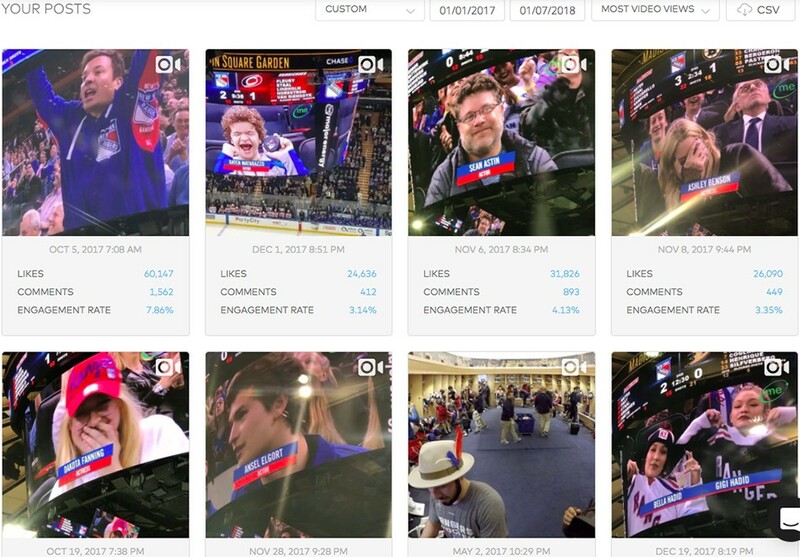 Yet more proof that the New York Rangers Instagram account is all about the Rangers brand and its world beyond the actual game is that the most viewed videos are mainly of celebrity appearances at the Garden, the team’s home. The non-celeb videos in the top mix are glimpses of player activities outside the rink. It’s all about the lifestyle and brand story for the Rangers fans! 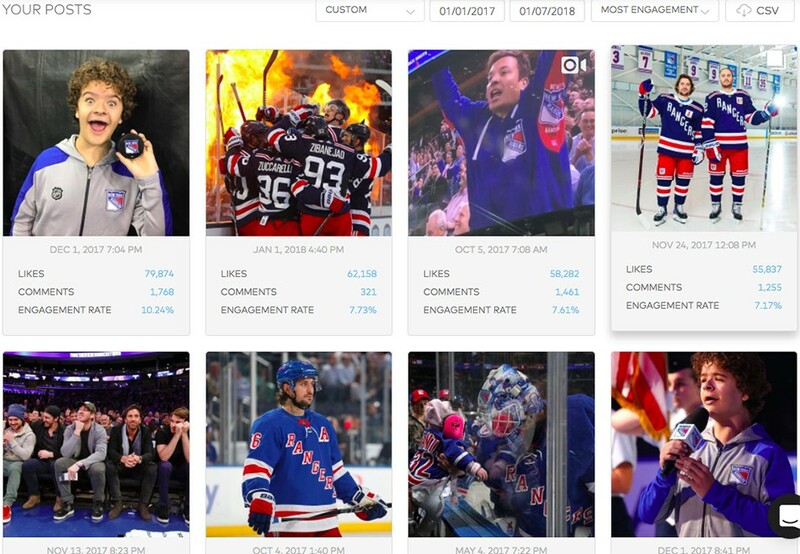 In the last 4 weeks, the New York Rangers Instagram account earned 1,476 pieces of user-generated content, which yielded a reach of 30,372,149. Hockey’s popularity is not as widespread, but the UGC tells a different story. Meanwhile in the NBA Instagram corner, one of basketball’s most famous teams, the Los Angeles Lakers, is doing quite the fine job on social. 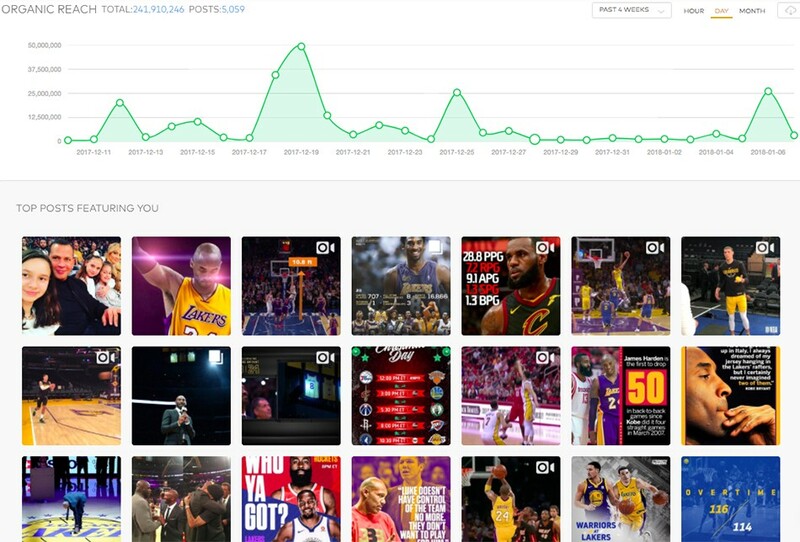 With an account of 4.2 million followers, marketers are surely focusing on how the LA Lakers use Instagram to engage fans, with an average landing at a solid 1.95%. So what does the team’s content tell us? In case we weren’t crystal clear on who the Lakers superstar is, we all became firmly aware when observing their account’s most engaged-around pieces of Instagram content this past year. 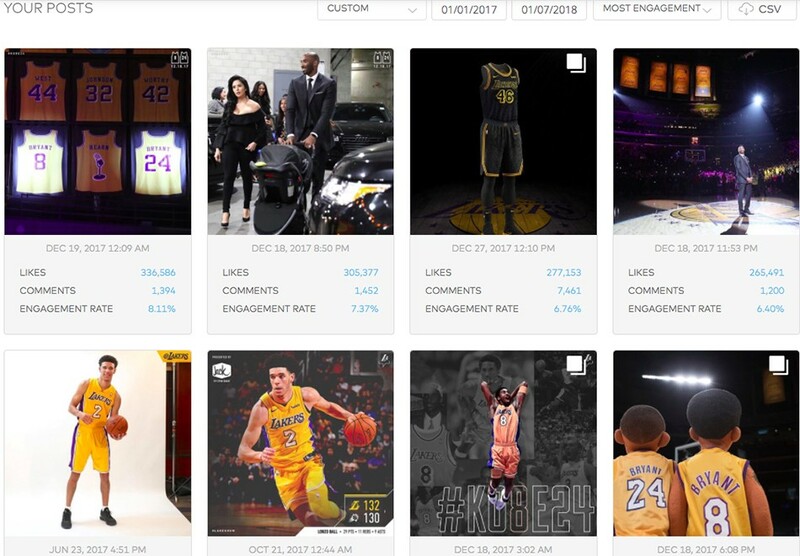 7 out of the account’s top 10 posts feature Kobe Bryant, while the other 3 are posts of the team’s other protagonist, the aptly named Lonzo Ball. Meanwhile, in the video category, what appeals to Lakers fans is the palpable excitement that masterful game plays generate. The most popular clips consist mostly of thrilling scoring highlights. 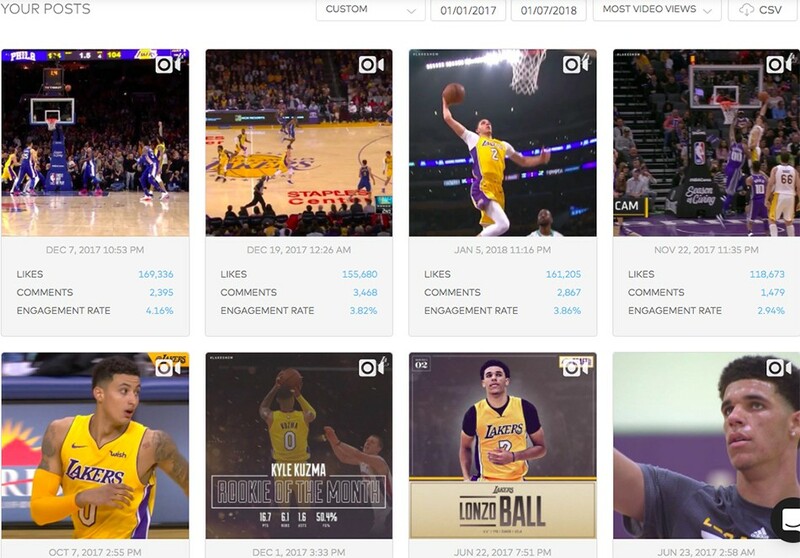 In the last 4 weeks, the Los Angeles Lakers Instagram account earned 5,059 pieces of user-generated content, which yielded a reach of 241,910,246. Basketball is big on hype, especially in LA. Last but ever so not least, we have the legendary Boston Red Sox in the baseball category. The team boasts an Instagram audience of 1.1 million followers and a high engagement rate of 2.2%. Looks like the team’s fans are almost as zealous on Instagram as they are at Fenway. When examining the Boston Red Sox digital strategy, it’s fair to say that the team caters to its devotees’ interest in all facets of the Red Sox world. 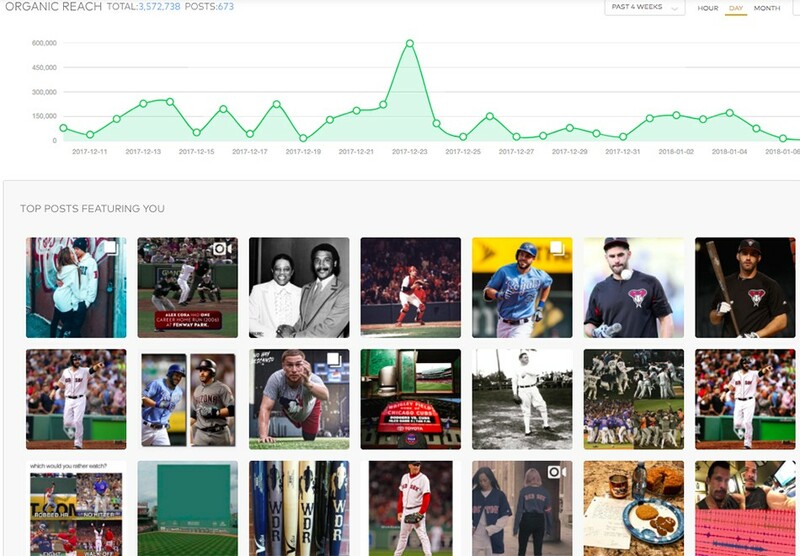 The Instagram account’s highest engaged-around pieces of content in the past year vary from off-season scenes that don’t pertain to baseball, to birthday wishes, player features, gratitude sentiments, and game highlights. 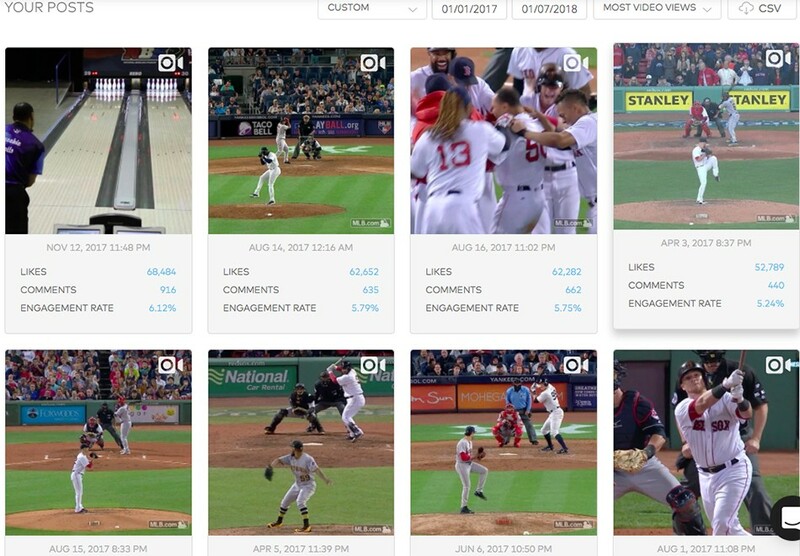 Meanwhile, on the video front, the most viewed clips are all highlights of impressive game plays, with the exception of the top clip: an off-season bowling video of star right fielder Mookie Betts showing off his seriously enviable strike skills. Perhaps proof that the fans are also interested in seeing clips of players’ more personal moments off the field? This is going to be a bit different than our other teams because baseball is currently off for the season. 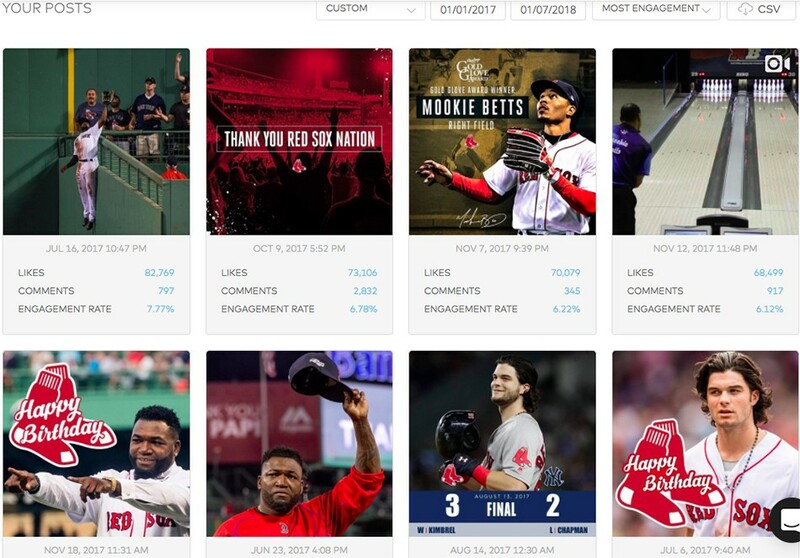 Nevertheless, the Boston Red Sox Instagram account still earned 673 pieces of user-generated content in the past 4 weeks, yielding a reach 3,572,738. Not bad at all considering they haven’t played a game since early October. It’s clear to see that all of these teams have devoted fans that use Instagram to further immerse themselves in the universe of their favorites. And there’s no better medium to impart those sentiments than social media. All of the accounts discussed above have experienced great success with video, something that other industries have struggled with. When it comes to professional sports teams, motion clips allow people to relive powerful moments, and to repeat those strong emotions they arouse more than once. There really is no better channel than Instagram to keep a perpetual contact with supporters and to amplify fan passion. Want to learn more about Instagram and visual intelligence? Hit us up today.